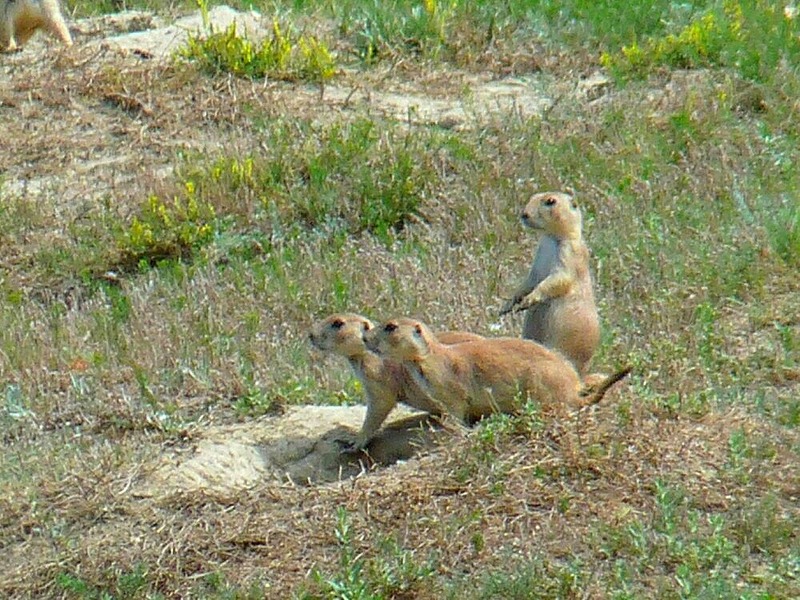 Prairie Dog Dinosaur Redux . 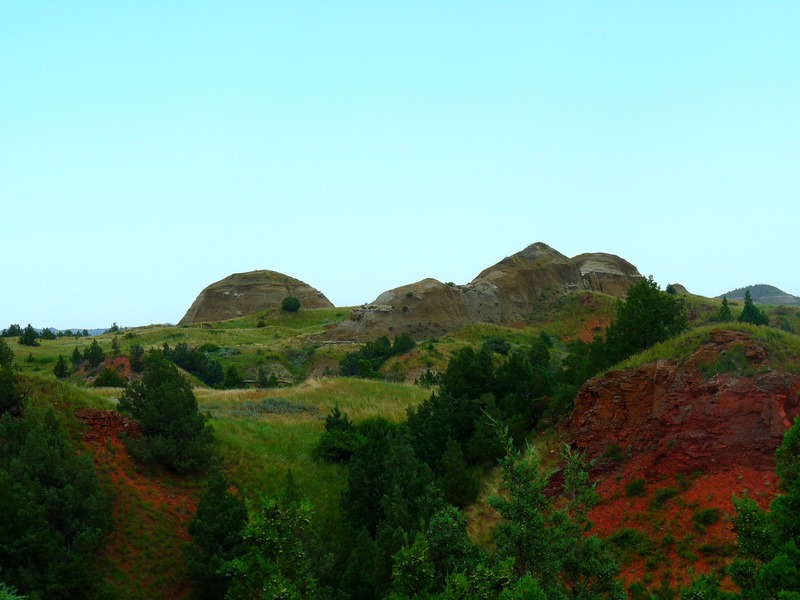 . .
A long day, so I thought I’d repost our visit to North Dakota in August 2011. 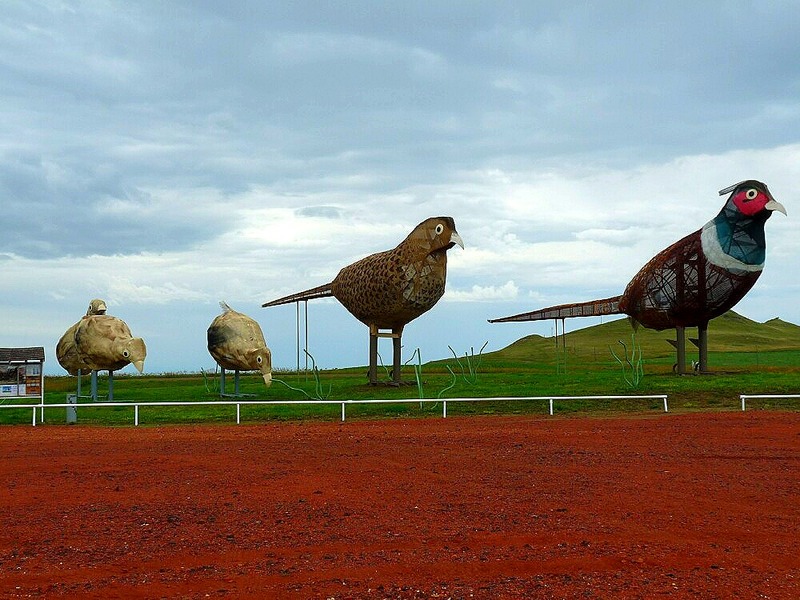 Prairie Dogs and Dinosaurs. What more do you need? After yesterday’s exhausting quixotean quest for the large pale cetacean, we opted for dinner and a movie. After checking local reviews, we decided to try Country Kitchen, a national chain. They have locations in 22 states, but we’d never heard of them. But luckily for us, the reviews were right. I had a double cheeseburger and Jan had a Spicy Chicken Sandwich. Both very good. As far as the movies go, we didn’t have a lot of choices – Cowboys and Aliens, Captain America, and The Smurfs 3D. But two out of three weren’t bad. We saw Cowboys and Aliens last night and decided to see Captain America tonight. And we did. We both really enjoyed C & A. Good story, with a lot of twists, great effects, and anyway, any movie with Daniel Craig, Harrison Ford, and big, nasty aliens, has got to be good. This morning was a tourist day, so we started it off with breakfast at Country Kitchen. After all, if it was good for dinner . 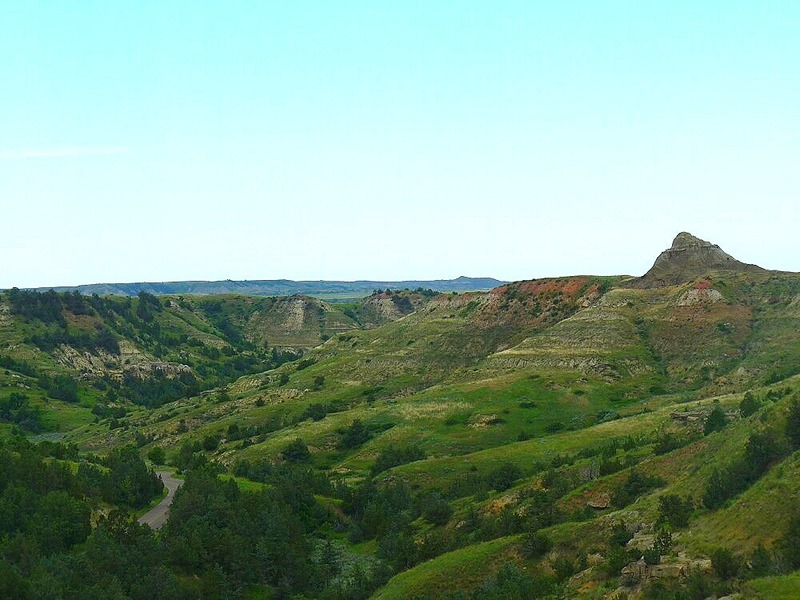 . .
And after a great breakfast, our first stop was Theodore Roosevelt National Park in Medora, ND, about 35 miles west of here on I-94. 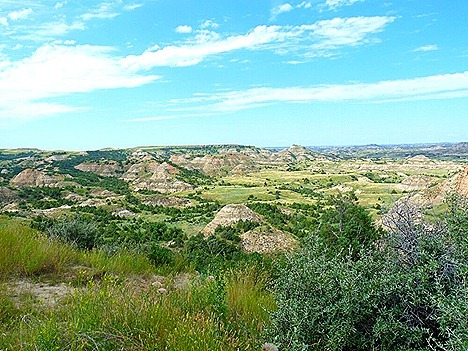 After getting our National Park Passports stamped at the Ranger Station, and checking out Teddy’s Maltese Cross cabin on the grounds, we headed out on the 36 miles scenic loop around the park. 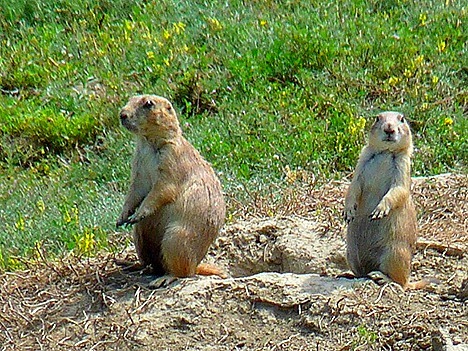 And of course the first thing that caught Jan’s eye were the prairie dogs. 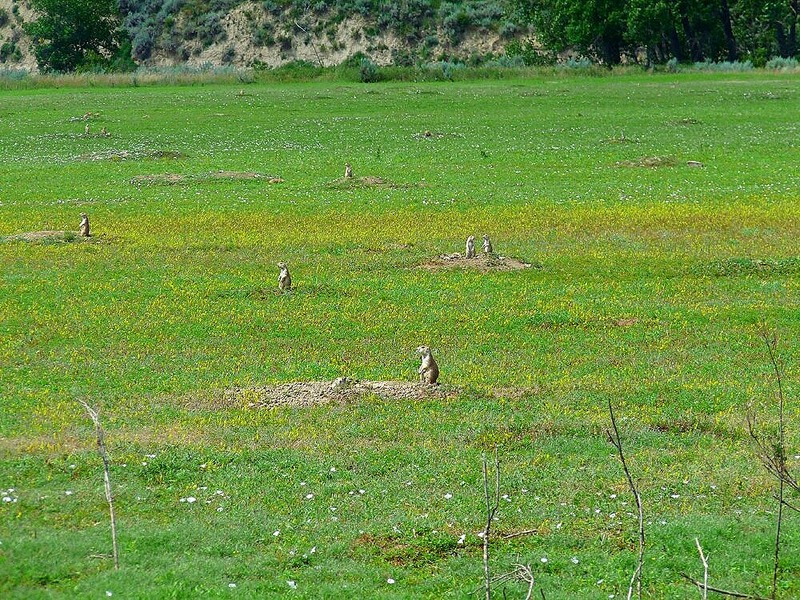 Lots and lots of prairie dogs. 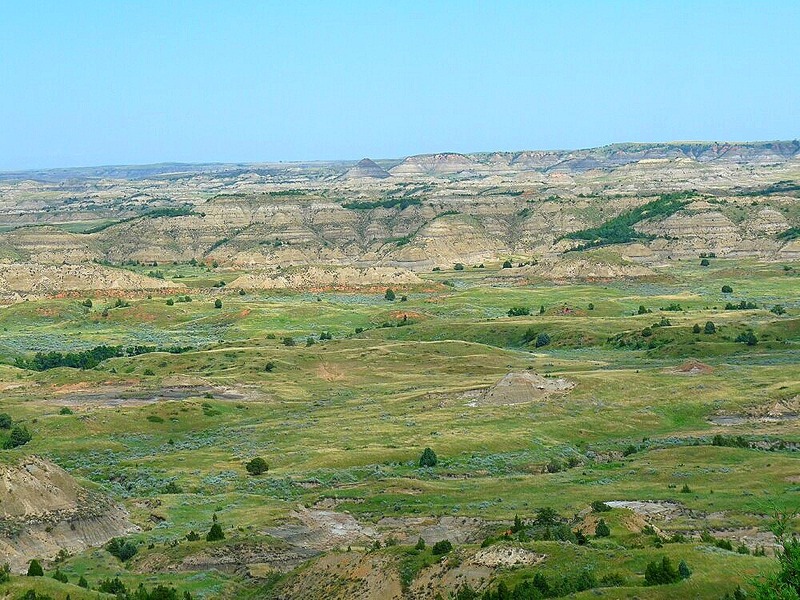 Whole towns of prairie dogs, as a matter of fact. It’s like they have their own personalities. 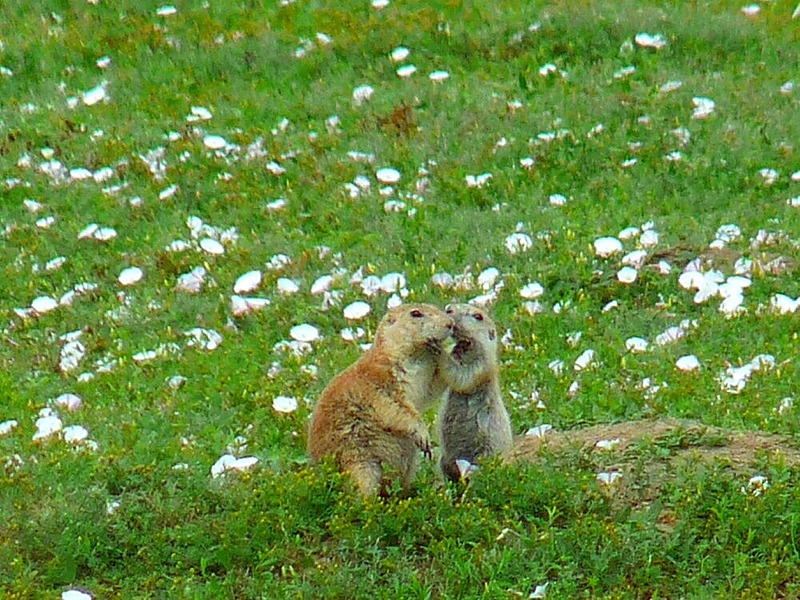 Here, the wife is giving her husband a smooch before he goes off to a hard day of finding seeds, leaves, grasses, and roots, and also dodging hawks. 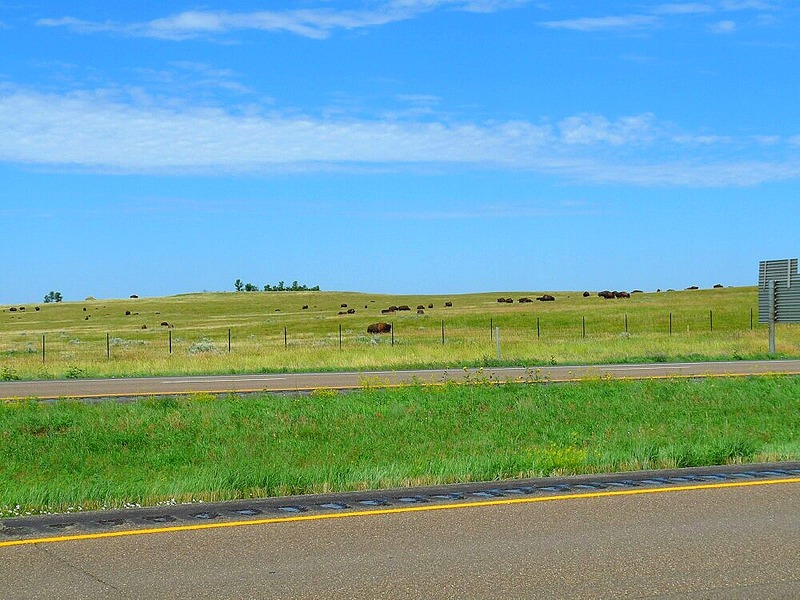 Life can be rough on the prairie. 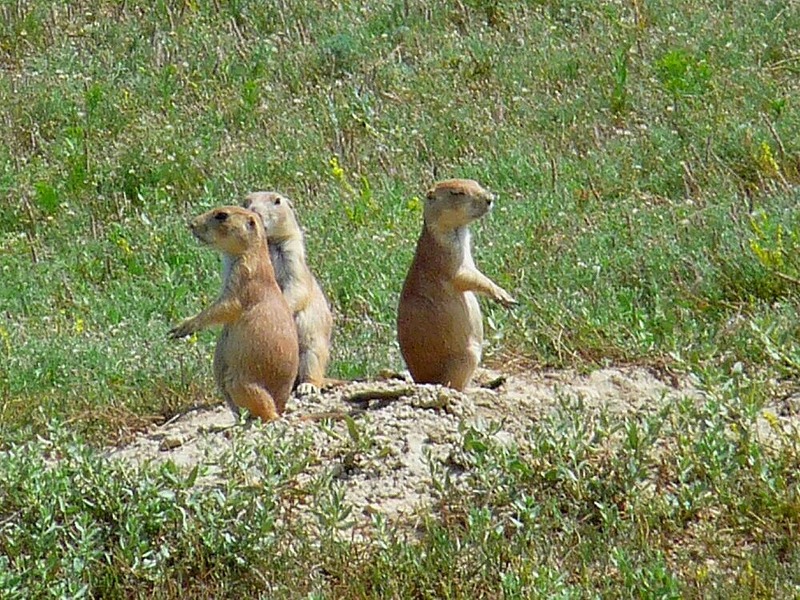 These three neighbors had a spat over who went down the wrong burrow, and now they’re not speaking. The guy on the right just discovered he’s on camera. And we did see some really beautiful scenery. 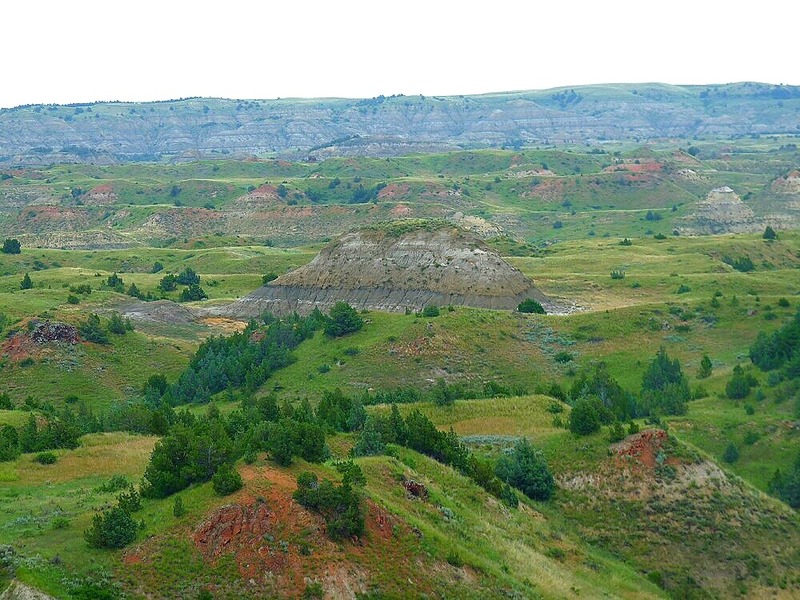 This park is part of the Dakota Badlands and it shows. 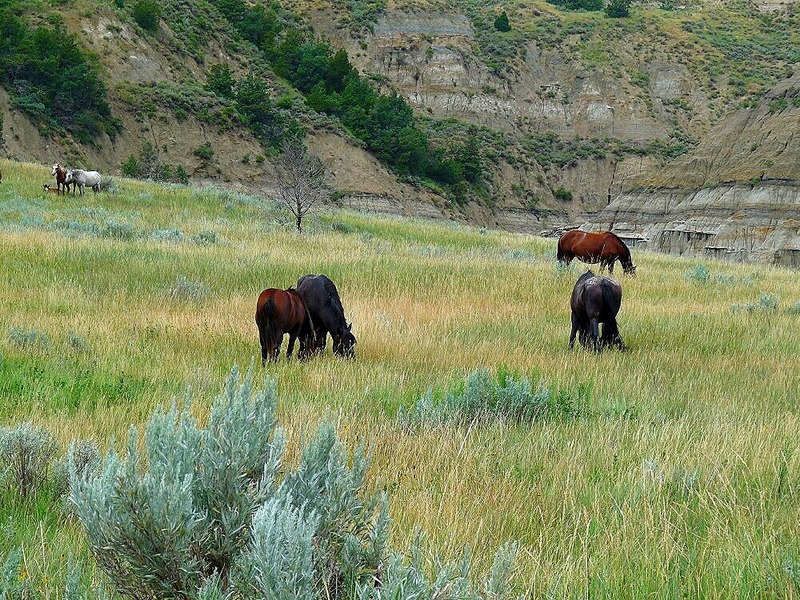 There are several herds of wild horses in the park, and we saw quite a few. 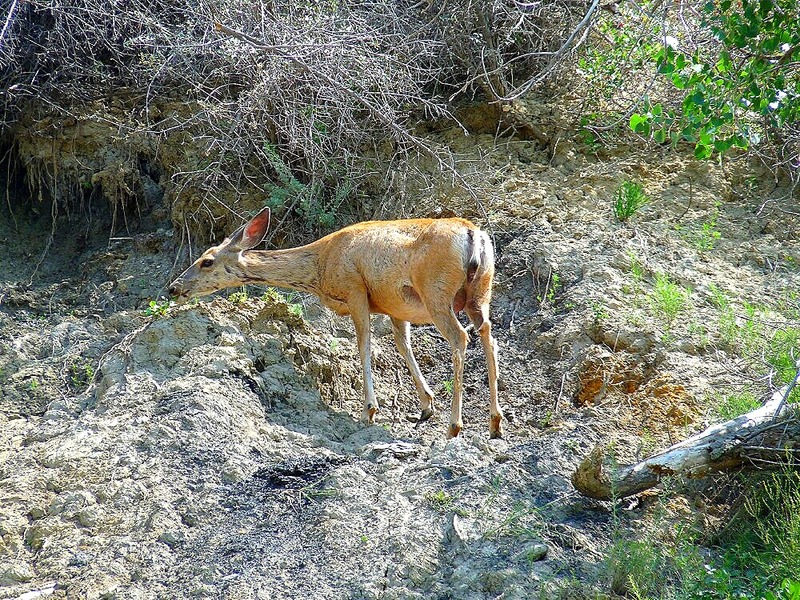 And toward the end of our drive we also saw this female deer high up on a ridge grabbing a snack. 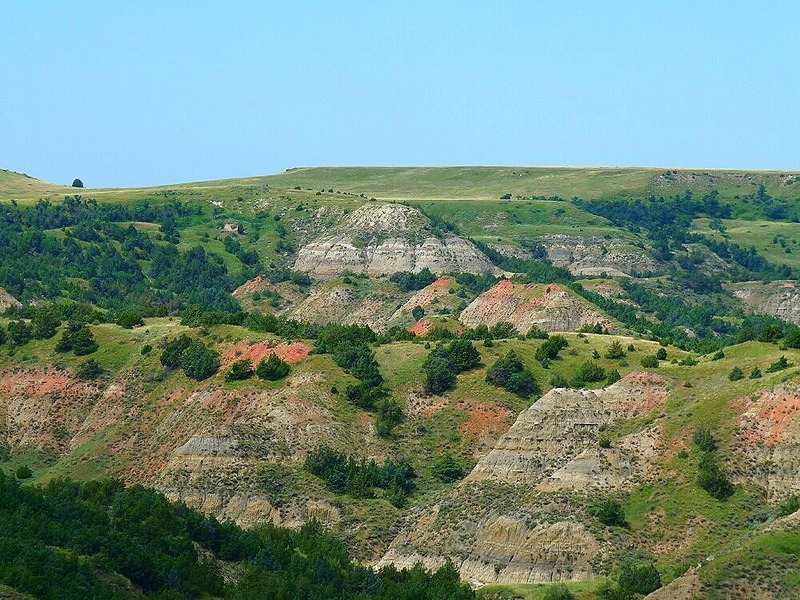 Leaving the park we headed back east on I-94 a few miles and stopped off at Painted Canyon, which is really just a continuation of Theodore Roosevelt National Park. 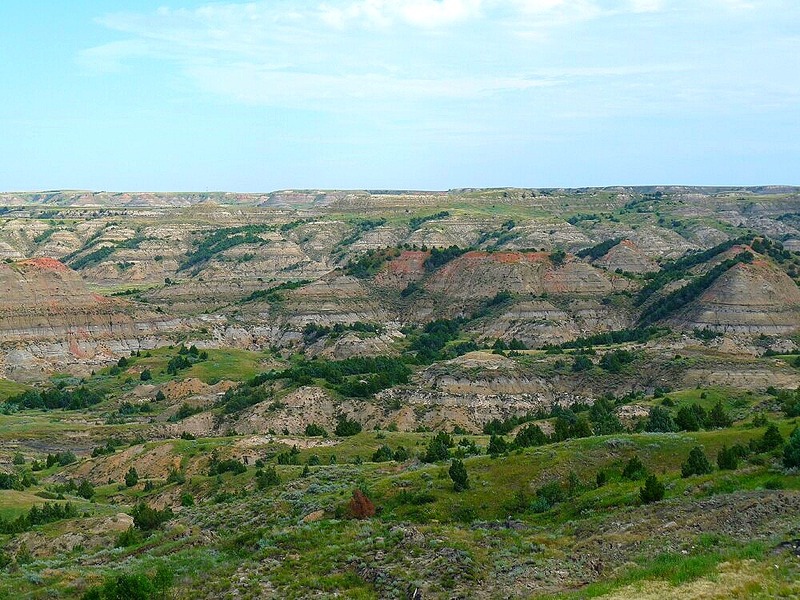 It’s easy to see why they call it Painted Canyon. 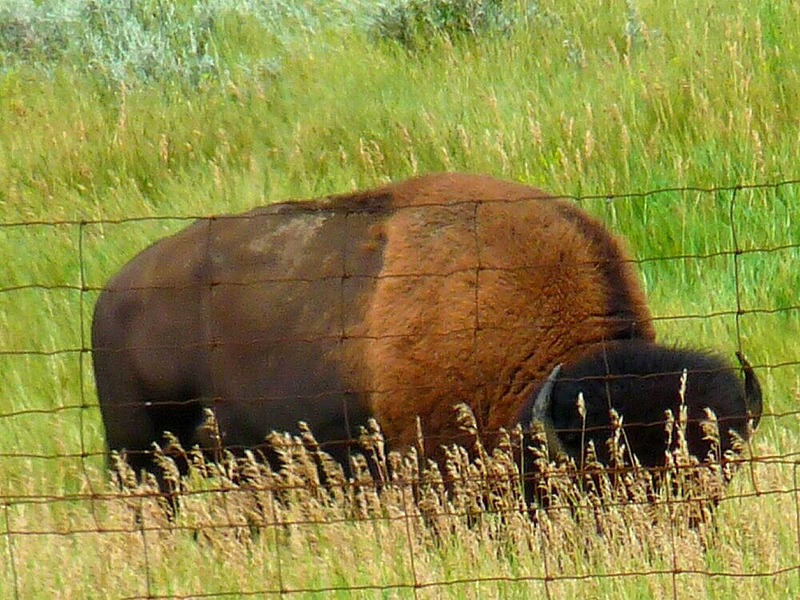 Again heading back toward Dickinson, but still within the park boundaries, we saw one of the several large bison herds in the park. Passing through Dickinson, and going about 10 miles out the other side, we turned south on the Enchanted Highway. Following up on Nick and Terry we saw some more of the really neat, very large, metal sculptures along the way. 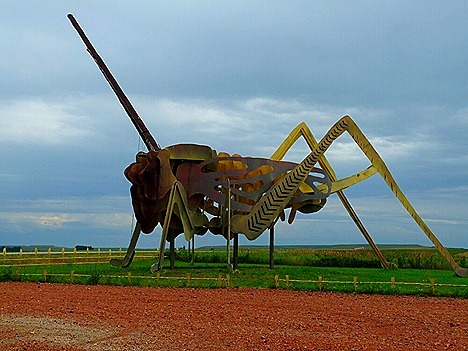 This grasshopper was huge, but I kept looking for the giant seagulls. A pheasant family, complete with chicks. 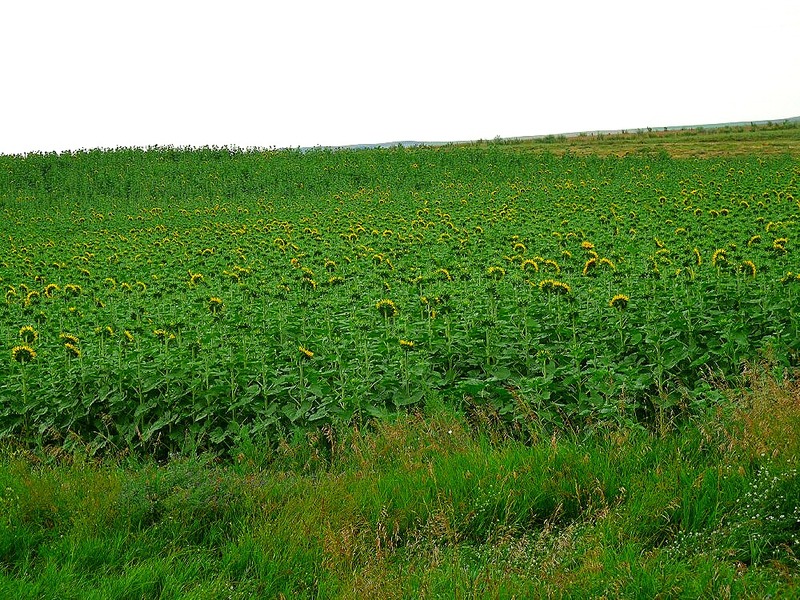 And Jan got this great shot of a field of sunflowers. 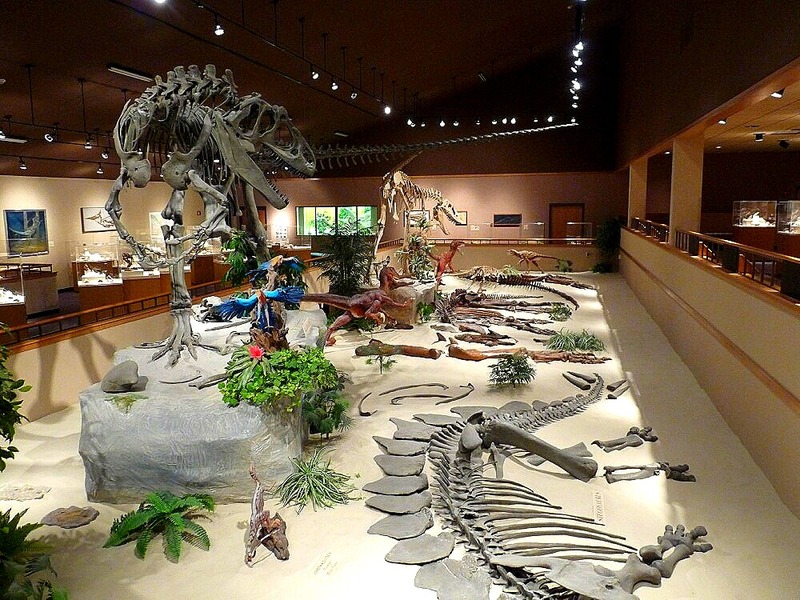 Again coming back into Dickinson we checked out the Dakota Dinosaur Museum. 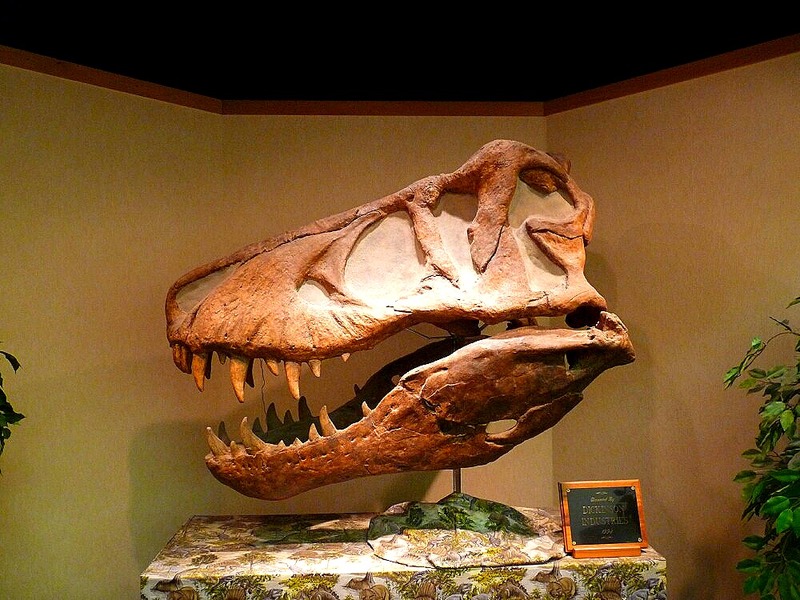 Although not as extensive as the one we saw in Thermopolis, WY last week, they did have some interesting stuff like this cast of a T-Rex skull, found just 200 miles from here in Montana. And this very nice display area. 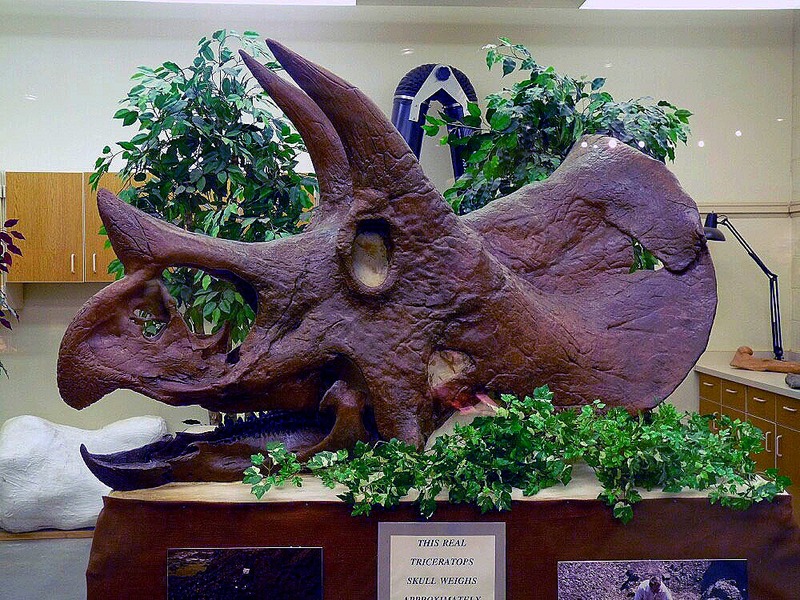 This is a REAL Triceratops skull, weighing about 1500 pounds. 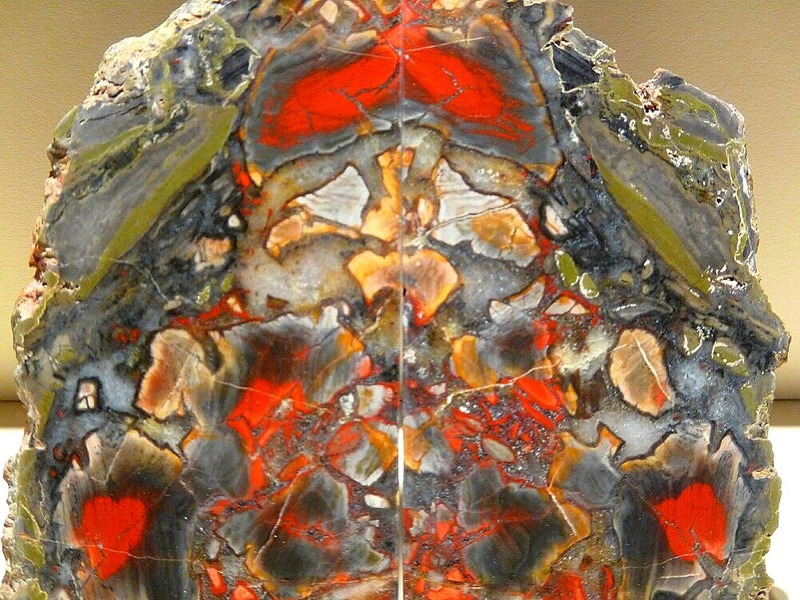 The weight of these fossils is why most of the assembled skeletons you see in museums are fiberglass casts. They would weigh 10’s of tons and would be very difficult to suspend safely. 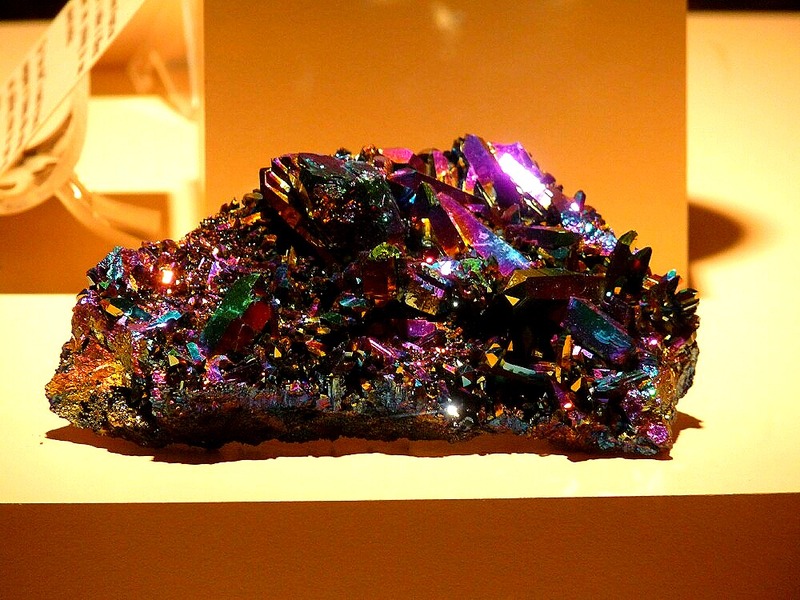 It’s not really purple, it just looks that way under the light. 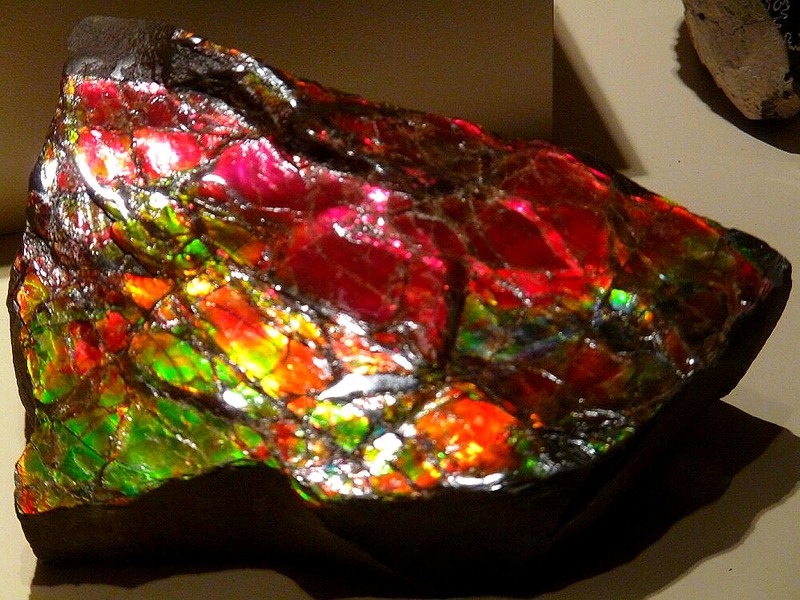 And Jan and I both really liked their large collection of beautiful rock specimens. By the time we left the Dino Museum it was almost 5 pm, so we decided to check out a place Nick and others had recommended, although Nick couldn’t remember the name of the place he was trying to recommend. It’s really sad to watch a mind just go like that. It turned out to be the Dakota Diner, and once again the recommendations were spot on. The place was jam-packed and really, really good. After dinner we came back to the rig for a while and then headed out to see Captain America at the movies. The movie, subtitled “The First Avenger”, was very well-done, and held very close to the original comic book origins. I hated it when they take a known character and then just completely change the storyline. This Captain America movie is the final one that will unite Iron Man, Thor, and Captain America, along with other superheroes in next summer’s “The Avengers” movie. Tomorrow . . . Fargo. The city, not the movie.